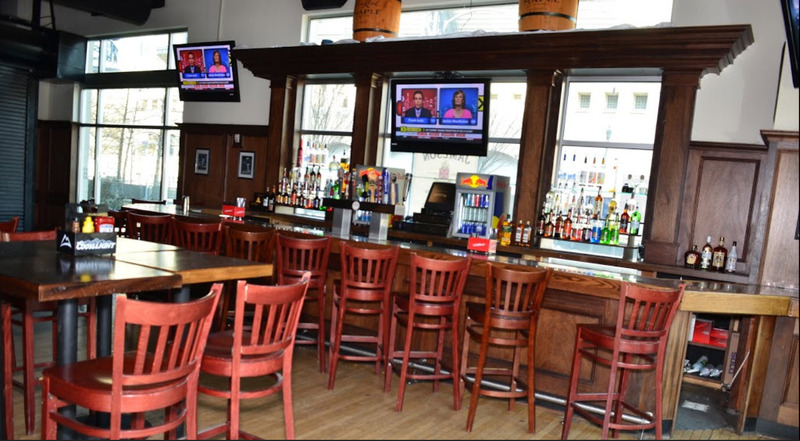 Leading Restaurant furniture distributor helps Pittsburgh bar & grill upgrade its look with restaurant new US made, solid wood bar stools and table tops. Leading commercial furniture distributor, Restaurant Furniture.net recently teamed up with McFadden’s upgrade its furniture by supplying it with new bar stools, table tops and table bases. McFadden’s, located in Pittsburgh, Pennsylvania serves traditional pub fare such as burgers, pizza and buffalo wings. They also serve chicken and steak and have a number of sandwiches. They have a full bar and live entertainment is available on the weekend. The owner contacted Restaurant Furniture. net for all of his restaurant furniture needs because of its reputation as a valued manufacturer of high quality commercial furniture. He purchased everything from restaurant chairs, bar stools and restaurant booths to table tops and table bases. For seating the owner decided to go with the Premium US Made Vertical Slat Wood Bar Stool and matching bar stool in dark mahogany finish with red vinyl seats. As with most of Restaurant Furniture.net’s wood furniture, the Premium US Made Ladder Back Wood Chair and Bar Stools are made in the USA of solid wood from responsibly harvested wood. The wood bar stools and chairs are available in 5 standard finishes: mahogany, walnut, natural, cherry and dark mahogany. “The Premium US Made Ladder Back Wood Chair and matching bar stools were just what the owner wanted to complete the classic look he was going for” said David M., salesperson for Restaurant Furniture.net. The Premium US Made Ladder Back Wood Chair is on sells for $78 and the bar stools sell for just $91. Restaurant Furniture.net also makes custom finishes for an additional charge. The vinyl padded seats, which are made in the U.S.A. are available in vinyl or fabric in a wide selection of colors and patterns and can also be custom made out of any material to the customer’s specifications. Solid wood seats are also available and a custom finish can be made for an additional charge. For tables, he decided to go with Laminate Inlay and Wood Edge Table Tops. The table tops, which are also made in the USA sell for as low as $127.50. They come in many different shapes and sizes. The tabletops are 1 1/4″ thick and are available in in any laminate by Wilson Art or Formica. “The premium finish of the table tops matched the mahogany finish of the chairs and bar stools, which was important for the owner” remarked David. Restaurant Furniture.net also supplied the table bases. Browse Restaurant Furniture.net’s full selection of commercial grade chairs, bar stools, table tops, table bases, booths and patio furniture at www.restaurantfurniture.net or talk to a customer service representative at (888) 409-1115. McFadden’s is located at 211 N. Shore Dr. in Pittsburgh, PA. They can be contacted at: (412) 322-3470. How Will Minimum Wage Laws Affect the Restaurant Industry?